British alpine skier Ed Drake has switched to ski cross in an attempt to qualify for the 2014 Winter Olympics. The 27-year-old competed in downhill, giant slalom, super-G and the super combined at the 2010 Vancouver Olympics, with a highest finish of 29th. But he is now trying out ski cross, where four skiers race against each other over a one kilometre course. "It is a big challenge to try and be ready in time for Sochi," said Drake. "I have been out of action from alpine for a couple of seasons now so my work ranking is poor. "That combined with an ankle operation in the summer has meant that qualification for any event at Sochi [2014 Winter Olympics] is going to be a big challenge." Ski cross made its Olympic debut in Vancouver and the former British alpine champion will need to rank in the world's top 32 at the end of January 2014 to qualify automatically for the 2014 Winter Games. Drake made his World Cup debut in Megeve, France, and promptly crashed out after hitting a gate. "After my first competition my interest in the sport has definitely increased and my alpine background has put me in good stead in some areas but ski cross has a lot of elements that are new to me and it will take a few more events before I know how far I can go," Drake told BBC Sport. "I haven't finished with alpine, but I have set aside a few ski cross events to see how I take to it before making any decision." British team-mate Pam Thorburn, from Strathaven in Scotland, is a similar alpine-ski cross convert and admits her first full season has been a steep learning curve. 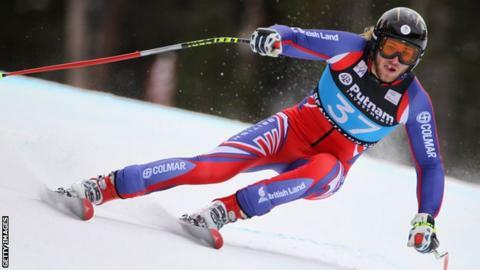 "It's so different to alpine racing, a completely different sport," the 26-year-old told BBC Sport. "The main difference isn't racing against three others at the same time, it's the jumps, rollers, and wu-tangs. You have to jump well and do it fast." How does Ski cross work? Thorburn began skiing at the age of three and switched to ski cross after the disappointment of not being selected for Vancouver Olympics, however she is on course for Sochi 2014 having secured the first of three top-24 finishes she needs in Megeve. "It's so achievable [to qualify], I know I can definitely do that," she said. And what of Drake's decision to switch like she has? "He [Drake] is a natural skier and good on the jumps," she said. "He's had a few crashes and at his first World Cup in Megeve, he said he would rather be throwing himself down the Kitzbuehel downhill but I think he will be well suited to it." Drake's recruitment is something of a boost to British Ski Cross which has endured a difficult season with GB number one Peter Whelan suffering an anterior crucial knee ligament injury in December after two impressive top 30 World Cup finishes. Team-mate Craig Robinson was forced to retire due to financial struggles and a recurring knee injury. "Bringing in a skier of Ed's calibre is fantastic for us," Ian Findlay told BBC Sport. "It's a big challenge, time isn't on his side, we have very limited resources and athletes are self funded so there's lots of obstacles to overcome. "He won't transfer and win straight straight away because it's such a competitive sport, but if he learns the track and features he will have a strong chance." Owing to the collapse of SnowsportGB prior to the Vancouver 2010 Games, many of the Winter sports have been starved of investment. British Ski and Snowboarding was awarded £584,300 worth for their freestyle disciplines in the run-up to Sochi 2014, but alpine and ski cross received no support. Findlay, who's manages the GB team on a voluntary basis, added: "It really has been a tough time for the sport. "But it's great to see someone like [freestyle skier] James Woods winning two World Cups and a real boost to British snow sport. "We are under no illusions as to where we are at the moment with results. "If we can move athletes into the top 16 in the world and then the top eight we would have a strong case for future funding," concluded Findlay.